I have recently attempted to declutter my home, inspired by all the Pinterest moms out there and the onset of spring, I felt getting rid of some things would take off the funk that winter had left on me. I’m like a bear when it comes to winter. I want nothing to do with the bitter, dark days, and would much rather spend my time sleeping it away on a full stomach. This left little time to do the not-so-important-things like cleaning my home, and with 4 family members, things can get cluttered pretty quickly. Other than the obvious things like getting rid of clothes I haven’t worn since pre-pregnancy, cleaning out the toy room that my children no longer use, or getting rid of everything in the garage that hasn’t been touched in a year, I wanted something that would help me declutter other spaces. I was on Pinterest one night and a pin on organizing your medicine cabinet came up. LIGHT BULB. The next morning I woke up bright eyed and bushy tailed with a plan in mind. I was going to run to the container store for some organizational bins that I could stack inside the cabinet, that way I could organize my medication by what it was used for. After going through what I already had on hand, I noticed that what most of my cabinet consisted of was pain relievers. I had nighttime pain relief, daytime pain relief, pain relief that had anti-inflammatory properties, baby, children and adult pain reliever, and pretty much any other kind you could think of! Right then, I knew if I could minimize it to one, maybe two, pain relievers then likely wouldn’t even need a whole medicine cabinet. 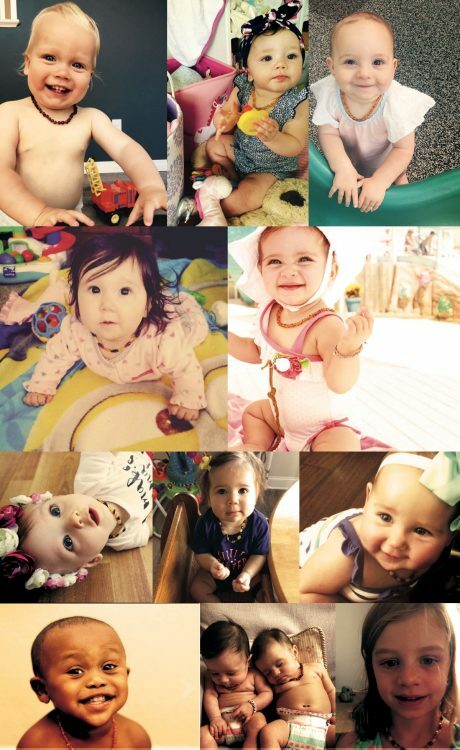 Still… what was one medicine that I could use for every single family member, big or small. I started researching what OTC pain relief options were out there, who could take which, and what it offered. For the most part, every suggestion was something I already had and didn’t fit the “every family member” bill. While talking to my mother that night, she suggested researching natural pain relief. She told me that most holistic medicines have multi-purpose and are safe for people of all ages. Genius! As soon as I typed that into google, infant amber teething necklace showed up! I had heard of it for teething infants but never as a multi-purpose pain reliever. How does it work? 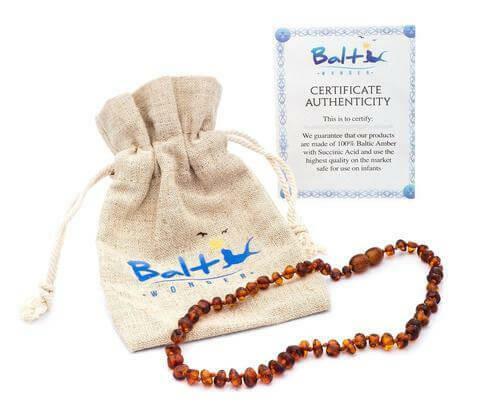 Baltic amber gets its name from the Baltic sea, the region it’s made in. Amber has been around for centuries and has been used for a broad range of discomforts. Succinic acid is found in amber, the key healing component, and is known for being a natural anti-inflammatory. For hundreds of years, countries located near the sea have used it for everything from headaches, inflamed gums, to joint and muscle inflammation, and the possibilities are endless! Recently amber necklaces have picked up steam for being a natural alternative for pregnant women who are experiencing the normal aches and pains that are accompanied by pregnancy. It works by being worn on the body so that your natural temperature can heat the bead, allowing for the medicine rich oils to seep through the porous surface of the bead and into the bloodstream. I bought 5 necklaces, one for each family member, and threw away all of my pain relievers. Not only was my medicine cabinet empty, but we had found a way to naturally improve pain caused by all things. Baltic amber necklaces did not disappoint either. My daughter and I are migraine sufferers and haven’t had one since we started wearing ours. My husband, who broke his back in 1989, hasn’t had problems with it since about the second week after wearing his necklace. It’s almost magical how one natural product was able to replace several OTC ones. If you’re wondering what nature can do for you, try Baltic amber today! There is a quick inquire to ask – how to generate this kind of awesome post? It has almost all factors what make a close review. There is a getting label and worthwhile information. Well done! I should accept that truly 1 of the most interesting content I have ever understand. It’s also expertly penned. I am an french instructor so I see what I mean. Very effective article! Really a perfect joy to study it. Congratulation! Well-done! I’m holding out for more messages. Hi every girl! It’s very fascinating review. I am amazed that you are so gifted. I failed to confidence you! Hey every person! It’s very fun document. I really am amazed that you are so capable. I failed to confidence you! Congratulation on creating great content! I should say that the document is a significant quality content and it matches all sorts of criteria. Well-done. Hello. Right here is an issue for everybody who look for premium quality content. Will you search for another site? If you inquire me I will express NO. That page is greatest for myself! Beloved author! Thanks a lot for being there and placing so seriously articles. Here is somebody who value it and express thank you! Hi everybody! It’s very cool document. I’m surprised that you are so skilled. I failed to confidence you! Congratulation on creating stunning reviews! I must express that the review is a maximum grade text and it fulfils all sorts of criteria. Well done. Hey. There is a concern for everybody who try to find excellent excellence reports. Will you seek another blog? If you consult me I will mention NO. This site is best for myself! Beloved publisher! Thank you for getting there and publishing so perfectly reports. Here is someone who love it and say many thanks! Hi here everyone! It really is very exciting post. I’m surprised that you are so capable. I don’t confidence you! Congratulation on composing brilliant material! I need mention that the article is a maximum excellence content and it satisfies all sorts of standards. Well-done. Hey. There is a question for everybody who seek excellent quality reports. Will you seek different website? If you ask me I will express NO. This website is best for myself! Beloved publisher! Many thanks for getting here and publishing so perfectly content. There is a person who love it and state many thanks! Hi everybody! It is very fun content. I am shocked that you are so qualified. I did not worth you! Congratulation on publishing outstanding posts! I need declare that the document is a significant excellence content and it meets all sorts of criteria. Well-done. Hi. There is a question for everyone who try to find big excellence articles. Will you try to find another site? If you inquire me I will say absolutely no. This website is greatest for myself! Hi publisher! Thanks a lot for staying here and sharing so well posts. Here is someone who appreciate it and mention thank you so much! Hi there every person! It’s very absorbing content. I’m surprised that you are so good. I failed to respect you! Congratulation on creating outstanding documents! I should express that the review is a maximum quality content and it matches all kinds of criteria. Well-done. Hi. Right here is an issue for everyone who try to find premium quality posts. Will you seek an additional blog? If you consult me I will mention absolutely no. That website is best for myself! Dear author! Thank-you for getting here and posting so perfectly articles. There is anyone who enjoy it and say thanks! I have continually asked yourself how to compose top superiority components and publish them on the site. Today I should say that the duty isn’t for me. I leave it for certified people. It really is very challenging to write a specialised texts in a brief time period and still posses brains full of ideas to generate brand new ones. I ought to declare that the blogger is a pro writer.